Sugar, one of the most enjoyable items to eat, is also arguably the most unhealthy for us. It is because it tastes so good that we eat as much of it as we do – which makes it hard to curb. And the volume we swallow every year seems to increase, along with a whole host of health problems that go along with it. Have You Ever Said “I Can’t Stop Eating It”? Probably. We all have. But don’t beat yourself up too much about it. Because it has been proven that sugar is possibly more addictive than cocaine! That’s believable when you see over and over the many people who obviously are struggling to control their weight, yet continue to eat large amounts of sugary products. It doesn’t make any sense, yet the pattern continues which makes sugar qualify as ‘addictive’. The reason is the hormone leptin, responsible for telling your brain “enough!”, has been compromised. And the smoking gun appears to be sugar, according to recent science. This explains why so many people eat past the point of feeling full, and why obesity is now an epidemic. (2) In fact your body gets tricked into thinking not only are you not full, but that you are starving. So it goes into energy storage mode and desires fats and sugars even more, as they represent quick energy. As well, your body’s mission, due to this state of scarcity, is to conserve energy. So your motivation to go to the gym is somehow dampened, to fulfill this mission. The list of health issues correlated with excessive sugar consumption is a long one. It elevates blood pressure; increases triglycerides and LDL; depletes vitamins and minerals; contributes to heart and liver damage and gout. For the average person 25% of their calories comes from sugar, which greatly contributes to insulin resistance and weight gain. Obesity is a glaring problem largely due to the sugar explosion in our culture, especially within this generation. You don’t have to be a doctor to look around and see how waistlines are constantly increasing. 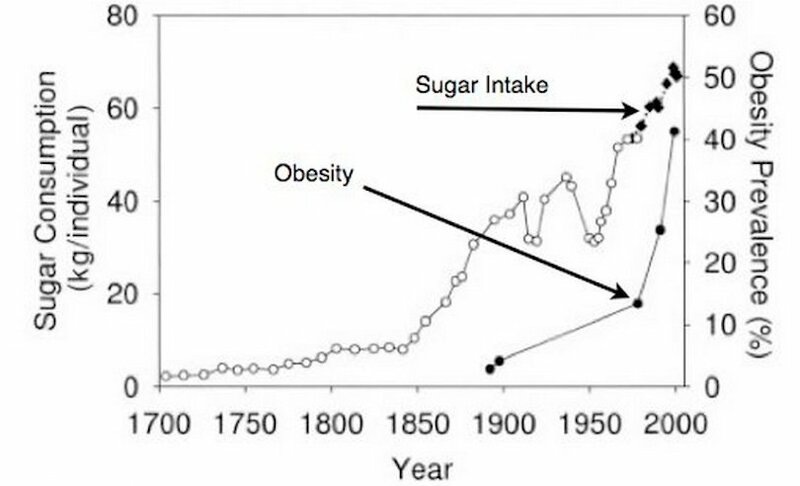 The graph below indicates the strong correlation with sugar and weight gain. Heart disease, kidney disease, and diabetes are all dangerous by products of excessive weight, which means that our love of sugar comes at quite a price. As 99% of calcium is in your bones, the increase in excretion simply reduces the amount of calcium in your bone, making them more prone to be porous and weak. And if that weren’t enough, the latest science suggests that excessive sugar intake is analogous to ingesting small amounts of cortisone which effectively makes your bones thinner. British physician Dr. John Yudkin found that healthy volunteers consuming large amounts of sucrose caused significant increases in the fasting serum cortisol level. Cortisol is secreted by the adrenal gland and is the primary corticosteroid . An excess of these hormones is implicated as a cause of osteoporosis. What Did Cleopatra Eat For Dessert? Humans have been enjoying sweets for thousands of years. The ancient Egyptians we know had sugar rich dates, figs, pomegranates and honey. In Roman times they made a forerunner of ice cream and sorbet using mountain snow and fruits and berries. But it probably was a blessing that such items were scarce, and therefore luxuries to them. So the amount of sugar consumed was kept in check. Today however, it’s the amount, combined with the countless products with added sugar, that has gone through the roof. The reason for this is in part due to the low fat diet craze that swept the nation in the 1970s. Seen as the culprit for weight gain, fat was largely pulled out of food products – but so was the flavor. Sales went down along with the taste. But manufacturers discovered HFCS (high fructose corn syrup) which was not only the cheapest form of sweetener, but also 20% sweeter than typical table sugar which is sucrose. So to gain back the lagging sales due to the tasteless fat free food trend, they added HFCS. Problem solved – for the manufacturers and their bank accounts that is. But this has created a problem for the bulk of the now bulky western world. As mentioned, part of the very big problem is HFCS is ubiquitous. The other fact that makes HFCS a double whammy to your health is that your body metabolizes fructose much differently than glucose. In fact, the burden of processing fructose lies with your liver. It may sound overly dramatic to refer to HFCS as the enemy. But it’s crucial to understand that it is altering the way your body regulates energy, and causing your appetite regulation system to tilt. When something is responsible for so much illness, it deserves to be called the enemy. Yudkin, J., Dr. 1973. Sweet and dangerous. New York: Bantam Books, 112. Saffar, J. L, et al. 1981. Osteoporotic effect of a high-carbohydrate diet (Keyes 2000) in golden hamsters. Arch Oral Biol 26:393-397.